Prop repair costs hltbna you below the waterfine? Try our stainless sled. If your boat business takes you where there's often trouble below, you need a prop that can take it. 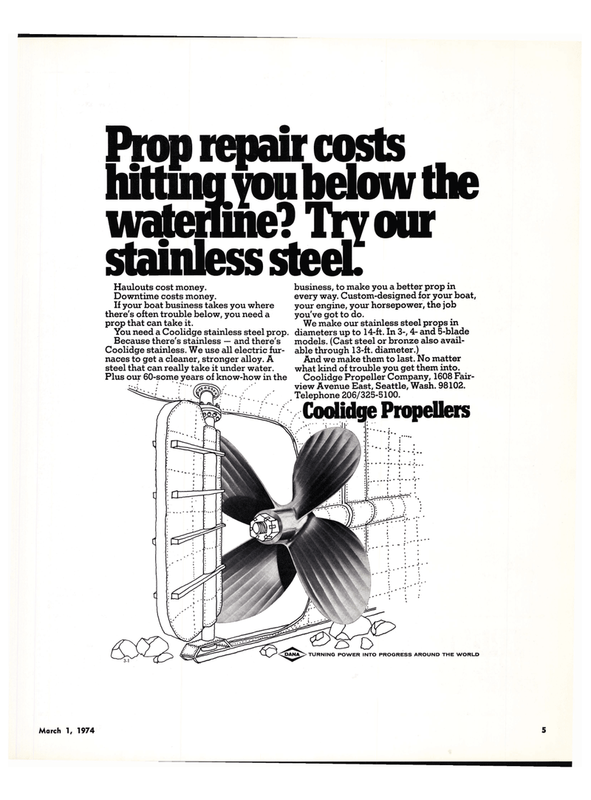 You need a Coolidge stainless steel prop. Coolidge stainless. We use all electric fur- naces to get a cleaner, stronger alloy. A steel that can really take it under water. TURNING POWER INTO PROGRESS AROUND THE WORLD business, to make you a better prop in every way. Custom-designed for your boat, your engine, your horsepower, the job you've got to do. And we make them to last. No matter what kind of trouble you get them into. Coolidge Propeller Company, 1608 Fair- view Avenue East, Seattle, Wash. 98102.